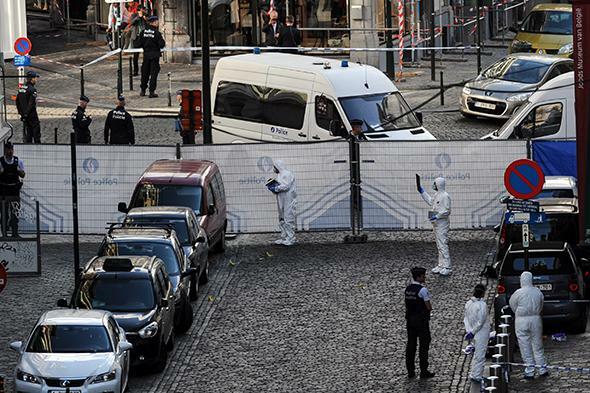 Brussels Jewish Museum shooting kills at least three. Three people—two men and one woman—were killed on Saturday when a gunman opened fire—seemingly at random—at the Jewish Museum in the Belgian capital. A fourth person is seriously wounded, reports the BBC. According to Belgian newspaper La Libre, a fourth person has died, although that hasn’t been confirmed and it’s unclear whether it’s the same person who was seriously injured. There are reports that one person has been arrested but authorities have yet to confirm that information, according to Belgian broadcaster RTBF, which claims the shooting took place both inside and outside the museum. The shootings come a day before Belgians will be heading to the polls for the EU elections. The gunman arrived at the museum in mid-afternoon on Saturday wearing a backpack and opened fire before fleeing in a car in what Brussels Mayor Yvan Mayeur quickly said was “probably a terrorist act.” Others didn’t wait to slap that label on the attack. “This is a terrorist act, the assassin entered deliberately in a Jewish museum,” the president of the Belgian League Against Antisemitism (LBCA) Joel Rubinfeld told the AFP. Another Jewish community leader described it as the first attack against Jews in Brussels since World War II. The shooting took place 15 days after far-right groups tried to hold an “anti-Zionist conference” that included notoriously anti-Semitic speakers and was ultimately banned, reports Le Soir. Didier Reynders, Belgium’s deputy prime minister and foreign affairs minister, was one of the first at the scene as he happened to be in the area at the time and quickly sent out a message of condolence. “Shocked by the killings at the Jewish Museum, I think of the victims I saw on site and their families,” he wrote.